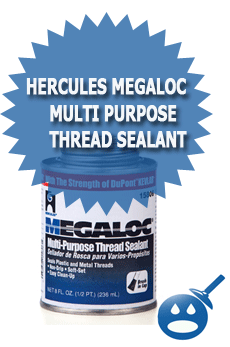 Hercules Real Tuff is a multi purpose thread sealant much like Megaloc but Real Tuff contains PTFE. 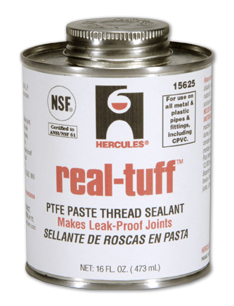 In fact Real Tuff has the highest amount of PTFE of any thread sealant on the market today. What makes Real Tuff with PTFE a great product is that it can fill any crack or even the smallest spaces. This product is leak free and can be tested once you apply Real Tuff to the joints. It can withstand vibrations as well as contracting and expansion issues. Just like Megaloc it will not separate or drip once applied. 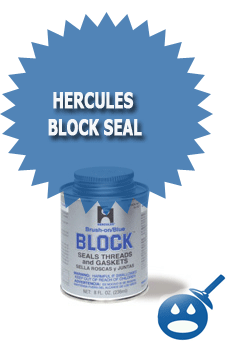 Real Tuff from Hercules has an advanced anti galling property when used with stainless steel. There is a great resistance to acids, alkalis and ketones. There is no cure time and it is a soft set sealant. The sealant can be tested and used immediately. This sealant is one of the premier thread sealants on the market today. Hercules Real Tuff can be used on lines that have Compressed Air, Butane Gas, Coal Gas, Hydrogen, Natural Gas, Sugar Liquid, Water Gas and much more. The Hercules Real Tuff can be used on materials such as Aluminum, PVC, Stainless Steel, ABS, CPVC, Synthetic Rubber, Glass and Natural Rubber just to name a few. This product is not recommended to be used on oxygen lines. For proper use, read the directions for use carefully if you have never used this product before. The Hercules Real Tuff PTFE Paste Thread Sealants formula was created to be able to stand up to temperatures from minus 200 degrees Fahrenheit to up to 550 degrees Fahrenheit. It can also withstand the gas pressure of 2,600 psi. There is not an applicable boiling point but the melting point is 620 degrees Fahrenheit. This product has a Liquid Pressure Rating of 12,000 Psi and a brush ability of minus 25 degrees Fahrenheit. Real Tuff is non-flammable and does not contain any heavy metal materials or any harsh solvents. The application is simple; just apply with the brush included in the packaging. The extinguishing media of this product is dry chemical, foam and carbon dioxide. It is important to keep product away from open flames and or sparks. 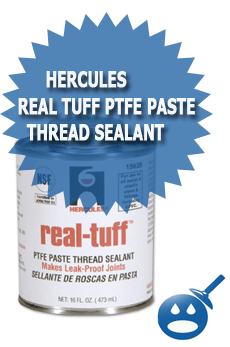 Hercules Real Tuff PTFE Paste Thread Sealant meets all required standards. It works very well with vibration, expansion and contractions. If you need more information about the Hercules Real Tuff, contact Hercules by phone, fax or email. The information is located on their MSDS sheets. Real Tuff has a shelf life of about 2 to 3 years if properly contained. This product is easy to use and there is no set time necessary at all. Real Tuff PTFE Paste Thread Sealant is available in 8 different sizes ranging from 2-ounce tube to 5-gallon container. Make sure that you read all of the necessary instructions and warnings before using this product. Keep out of reach of all children and pets. You can find Real Tuff PTFE Paste Thread Sealant at your local plumbing supply store or your local home improvement location.